A Durian (fruit having pungent smell) like shape. This is the centre for performing arts featuring various events. Also a nice place to dine and shop which is close to Merlion. Better to combine the esplanade with the Merlion park. What caught my attention was 'Joyful moments photos backdrop'. Merlion is the national icon of Singapore. A 37 metre tall statue which is an imaginary creature with lion's head and fish's body. Merlion means sea and the lion (Mer+lion=Sea and Lion). The head of the Lion represents the Singapura (Singapore's original name) and the fish represents the Singapore's origin as a fishing village. Located nearer to "One Fullerton". 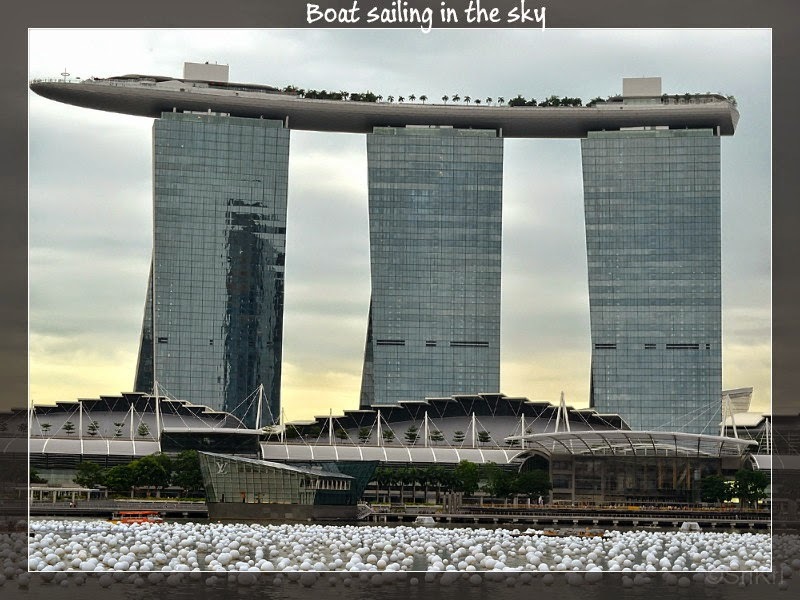 Skypark which is in Marine Bay provides the best view of Singapore. Marine Bay is a 55 storey high building having integrated resorts that features hotels, shopping malls, casinos, restaurant, infinity pool and observation desk with an amazing architect. The top looks like a boat shaped structures that is hanging in the sky. Went to the observation desk to view Singapore City, but was really disappointed as it covers only a quarter of the whole skypark. The other side is the infinity pool which is not allowed for the public and is available only for the Hotel guest. Spent some time taking the night view of the city. Want to have the the Kaleidoscope feeling of Indian community? Visit Little India and have the ecstasy here. Immerse youself in the street that sells souvenier, Indian vegetables, handicrafted items, sarees, dresses, trinkets, watches, cosmetics etc. Smell the aroma from garlands, shop selling spices, incense and mehendi. Feeling hungry and looking for Indian vegetarian hotel? Then there are few restaurant in this place like komala Vilas, Komalas, Saravana Bhavan. Tap your feet end enjoy the Indian music being played on most of the shops. Love for jewellery get into gold shop. A crowded place where everthing is busy. If you have not purchased any souveneirs for your friends and family you can buy here. There are few temples located nearby, like Veera Kaliamman Temple, Sri Srinivasa Perumal Temple. A 24 hours shopping centre where you get all the stuff at reasonable price. A money changer is there to help you if you want to change the currency. If you are a tourist and buying goods worth more than SG$100 (this could change from time to time), go to the GST counter along with your passport and fill the Tax refund forms. For this certain conditions are to be fulfilled. 1) Keep Universal Adapter handy. 2) Take Umbrella or rain coat always. 3) Require a good and comfortable pair of walking shoe (you have to walk most of the time). 4) Start/Go early as possible to cover most of the area. 5) Always keep a MRT (Mass Rapid Transport)/Bus map. 6) Refund of GST: If you are a tourist and shopaholic, ask for Tax Refund form. For more info check Singapore Customs website.